Tales of cowboys and cattlemen dominate western history—and even more so in popular culture. 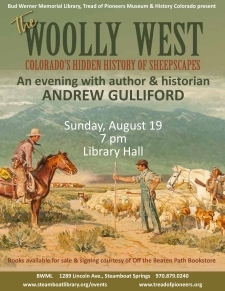 But in the competition for grazing lands, the sheep industry was as integral to the history of the American West as any trail drive.Author and historian Andrew Gulliford explores the sheep industry’s place in the history of Colorado and the American West in his new book, The Woolly West. With vivid, elegant, and reflective prose, Gulliford explores the origins of sheep grazing in the region, the often-violent conflicts between the sheep and cattle industries, the creation of national forests, and ultimately the segmenting of grazing allotments with the passage of the Taylor Grazing Act of 1934. Deeper into the 20th century, Gulliford grapples with the challenges of ecological change and the politics of immigrant labor. And in the present day, as the public lands of the West are increasingly used for recreation, conflicts between hikers and dogs guarding flocks are again putting the sheep industry on the defensive. Gulliford weaves in accounts of his personal interaction with what he calls the “sheepscape” — that is, the sheepherders’ landscape itself. Here he visits with Peruvian immigrant herders and Mormon families who have grazed sheep for generations, explores delicately balanced stone cairns assembled by shepherds now long gone, and ponders the meaning of arborglyphs carved into unending aspen forests. 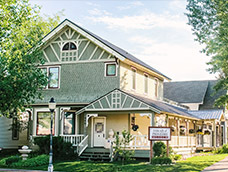 The Woolly West is the first book in decades devoted to the sheep industry and breaks new ground in the history of the Colorado Basque, Greek, and Hispano shepherding families whose ranching legacies continue to the present day.